The purpose and objects for which the corporation is organized shall be to combat community deterioration and preserve and develop the beauty of the city of Atlantic, Iowa, and the surrounding area; to promote and encourage historical research; to acquire, by purchase, gift, devise, or otherwise, the title to, of the custody and control of, historic sites and places; to preserve and protect buildings and sites of historical interest; to collect and preserve records, relics and other things of historical interest; to foster and promote public knowledge of an interest in local, state and national history. — Atlantic Rock Island Society Enterprise By-laws, November 27th, 1992. To preserve and protect historical sites, artifacts, and documents and to promote public knowledge of local, state, and national history. Atlantic Rock Island Society Enterprise (ARISE) a501(c)(3) Non-Profit Tax ID #42-1396129 organization, owns the Rock Island Depot and the American Legion Memorial Building in Atlantic, Iowa. ARISE actively restores old buildings and keeps them in use for the good of the community. 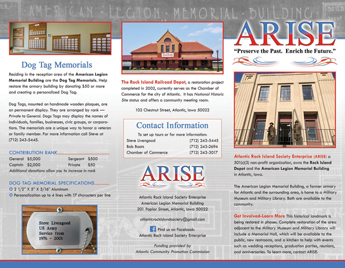 One of ARISE‘s main goals is to provide veterans in the surrounding areas a place to meet and also to be given the opportunity to share some of their history with the community through our library and museum. ARISE also works to preserve artifacts and books given by veterans that have passed away and to educate the community of their legacy. You can help ARISE with their current endeavors by purchasing a Dog Tag Memorial or donating to ARISE.